Today your adventure begins as you drive out through the beautiful Mongolian countryside (approximately 9 hours). Our transport for the trip are sturdy and reliable Russian vans, known as 'furgon'. These are definitely the best way to tackle the Mongolian roads that await us! Please note that depending on the size of the group we may be split into a number of vans. Your leader will take it in turns spending time with each van and you are welcome to swap around so that you get a chance to spend the travel time with different members of your group. There's plenty of driving on this trip across some rough terrain but the experience of our drivers will make the journey pass as smoothly as possible. Driving times will vary and any times listed here are approximate only. Actual travel time will rely heavily on weather and road conditions. As we have our own vehicle it may also be possible to make some stops along the way for photos, meals or to chat with locals however we need to aim to complete our drives before nightfall for safety reasons. Most days we drive up to 9 hours total. Mongolia is a vast and sparsely populated country so in order to see as much of the landscape and culture in the two weeks that we have we cover some large distances on this trip. Most of the drive today is on paved roads, but be prepared for some bumps after the final turnoff to the the remote Amarbayasgalant Khiid. 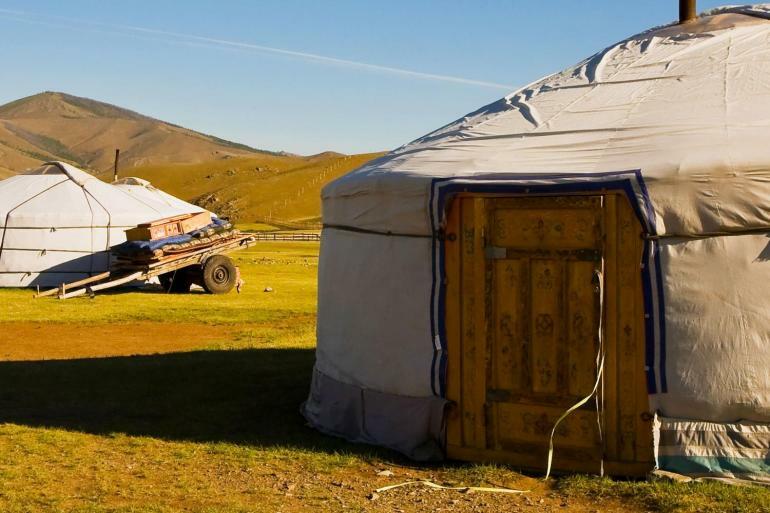 Your leader and drivers will be glad to teach you some basic Mongolian words on the way – a great way to prepare for interactions with the locals, few of whom speak English. Your final destination today is Mongolia's second most important place of worship (after Gandan Monastery in UB), situated in the beautiful Iven Gol River valley, at the foot of Burengiin Mountain, in the Selenge province. After seeing the monastery, you will get your first taste of life in a ger at the first camp of the trip. 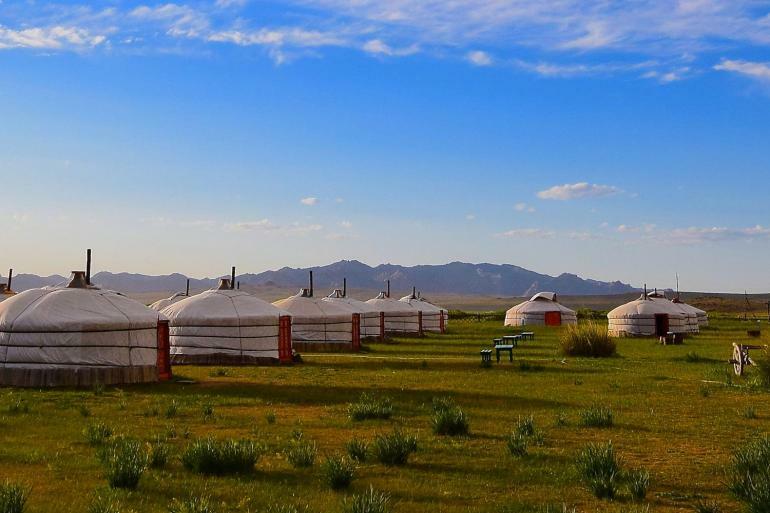 This is the way that the majority of Mongolia's population has always lived – away from the city and in the wide open spaces of seemingly endless countryside. It's the quintessential Mongolian experience. Although such camps are set up for visitors, this type of housing is still used around the country, even in the capital where you will have seen many 'ger suburbs' surrounding the city centre. The gers at the tourist camps where we stay most nights vary in standard and facilities. Most sleep up to 6 people with comfy beds and plenty of blankets. In the colder months you might want to stoke up the stove in the centre of the ger and you'll be toasty warm in no time! Some have generator or mains electricity although not all have power sockets in the gers to charge electronic equipment. Our drivers and leader also often double as our cooks in those places where we prepare meals ourselves. You are always welcome to lend a hand too! We share our meals together in the dining quarters. Vegetarians can be catered for although choices may be limited - please let us know if you have any specific dietary requirements at time of booking. Breakfast, lunch and dinner are provided each day until our return to Ulaanbaatar. Some food will be traditional Mongolian style but as the traditional diet consists solely of meat and dairy products, most meals are less challenging and based more on Russian or Western meals which are now also common in the Mongolian diet. Bathroom facilities here are usually very simple. Camps have showers but not always hot water and all have flush or pit toilets and basins with cold water in a support building outside. Other tourist ger camps on our trip may vary slightly in set up and some may have access to showers and hot running water. Your leader can give you more detailed information about the upcoming accommodation in the daily briefing.